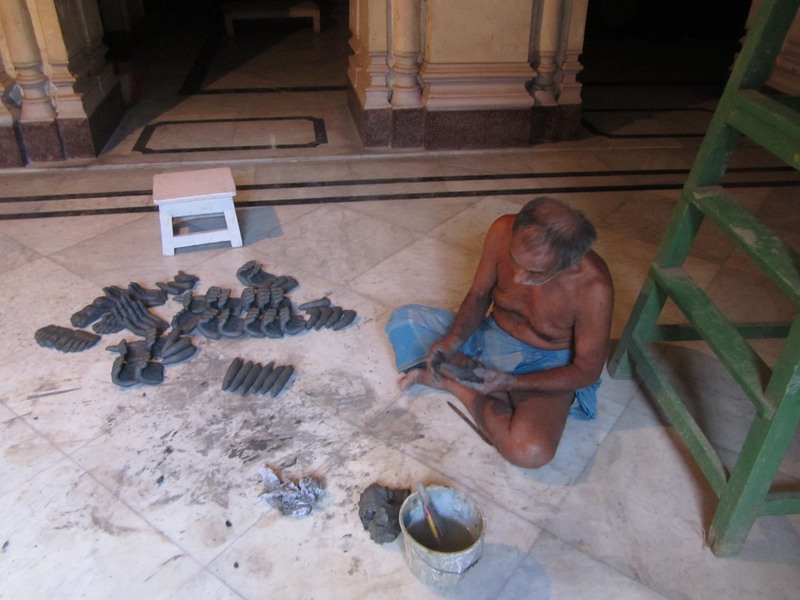 With great excitement, I returned to Kolkata at the end of the first week of September, specifically to observe Dilipda and his assistants in the next stages of work on their Durga Puja sculptures at the Shovabazar Rajbari. 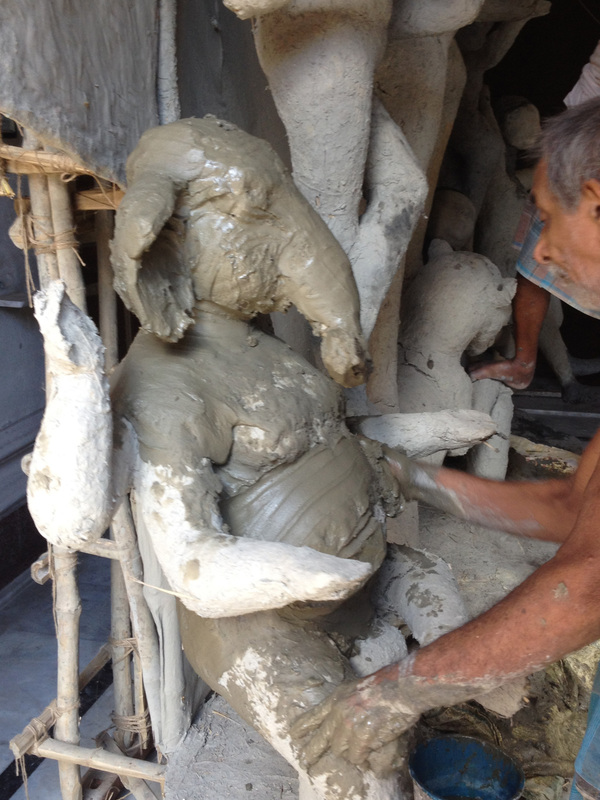 In the above photo, Dilipda’s assistant, Netal Pal, is adding the second layer of smooth clay to this roughed-out form of Ganesha. 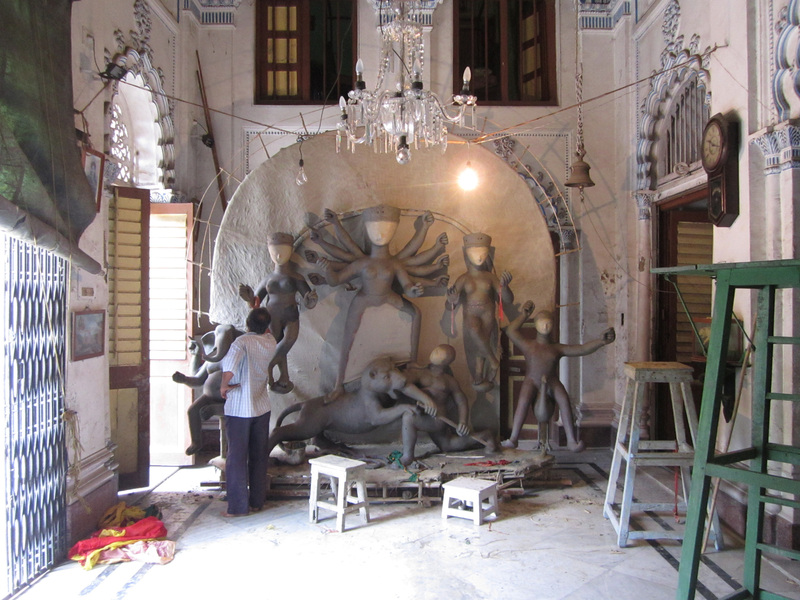 You might remember from an earlier post that this Durga Puja tableaux of images had been started about a month ago, and had been given several weeks to slowly dry. 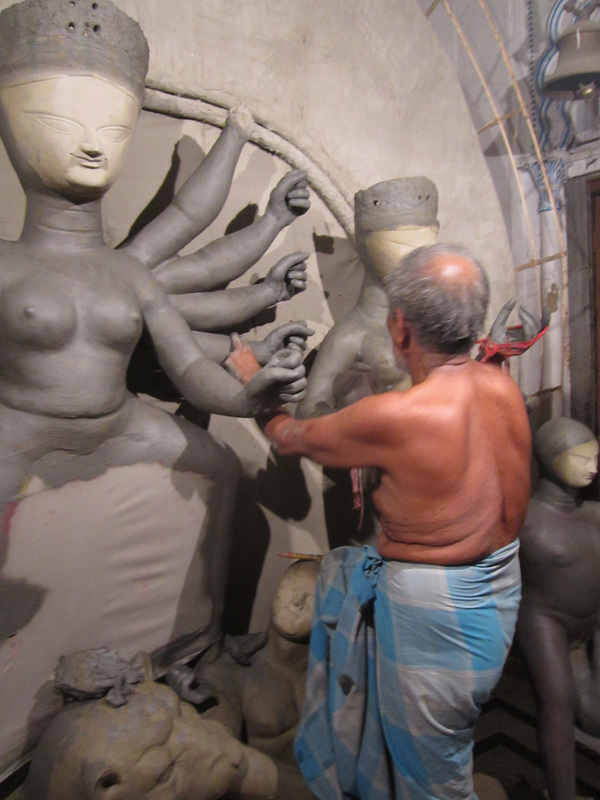 Below, Dilipda’s other assistant, Bishonal Pal, works on adding the second clay layer to the Durga form that is central to the entire tableaux, or . 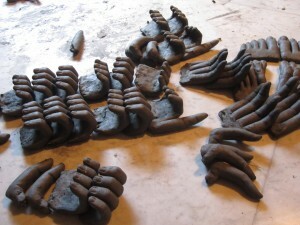 When I returned the next afternoon, Netal Pal was sitting on the floor with a chunk of clay from which he was modeling the hands and feet for all of the figures. 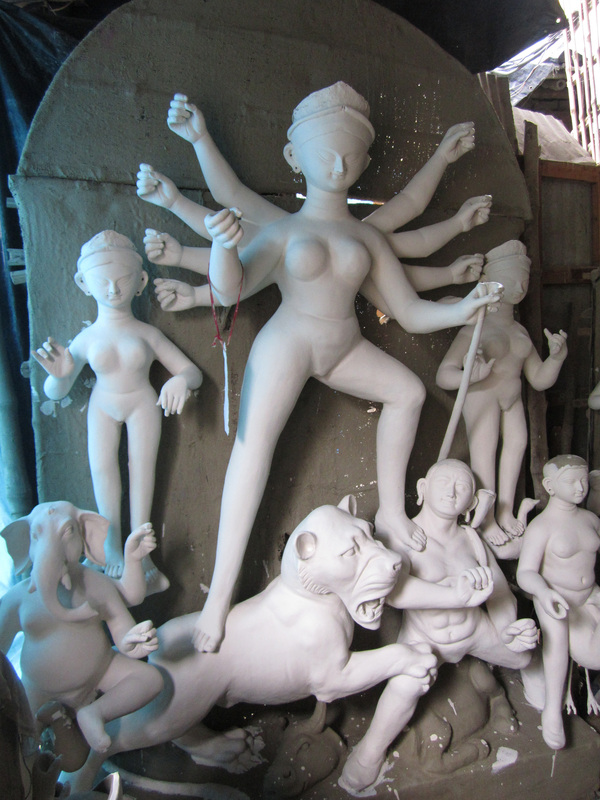 Then — Netal and Bishonal began to add the hands and feet to each figure, ending with Durga’s ten hands — and for me a magical energy filled the Rajbari. 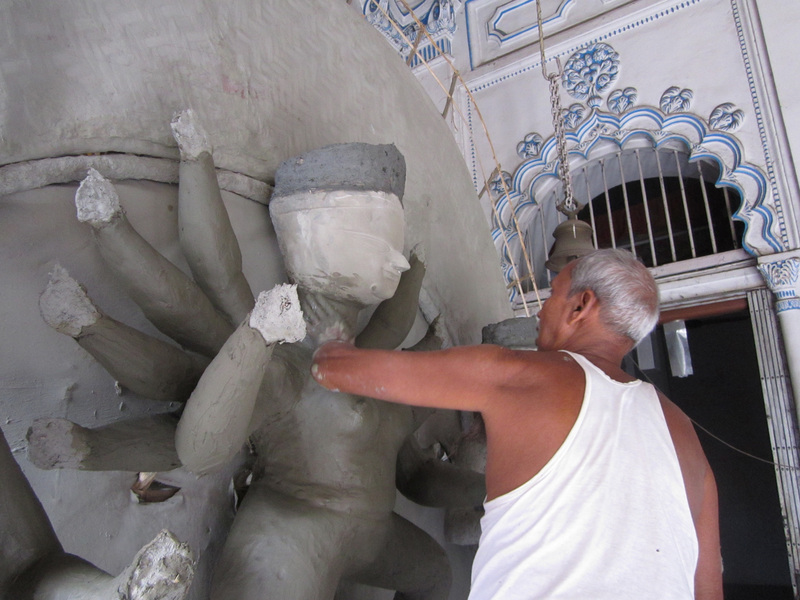 I felt an intense need to stay and observe until Durga’s final hand was attached and secured to her tenth wrist. 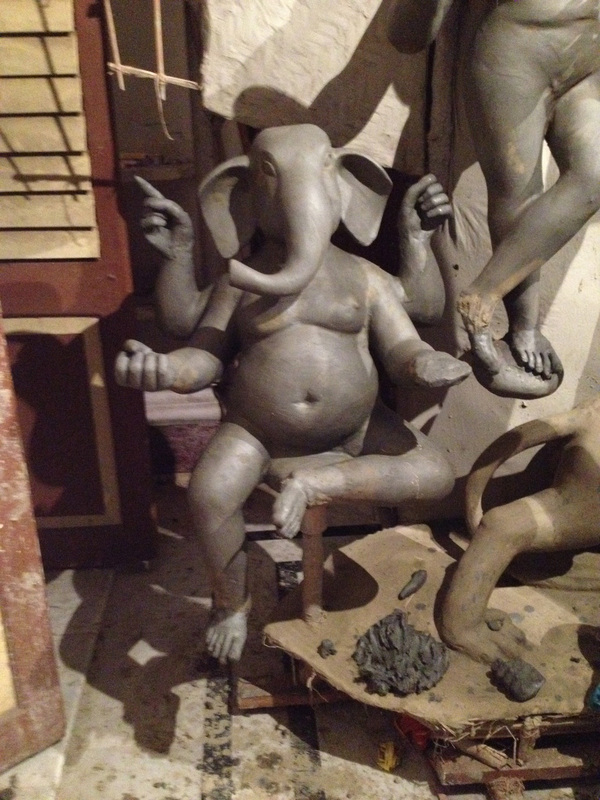 Ganesha (above), now fully detailed and needing just one more hand! Bishonal Pal works on Lakshmi and Netal Pal works on Kartik. In the above photo, Dilipda is working on refining the details of the images. His images are structured in what several people have referred to as the “traditional” style. 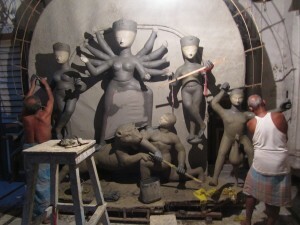 However, regardless of the style in which the figures are rendered, most Durga Puja sculpture groupings have the following images (I’m listing them in bold from left to right): Ganesha; Lakshmi; Durga; below Durga is her Lion, who along with Durga, is attacking Mahishasura, the Buffalo Demon; Saraswati, and Kartik. Often Mahishasura will be emerging from a buffalo form (he is after all, half man and half buffalo). 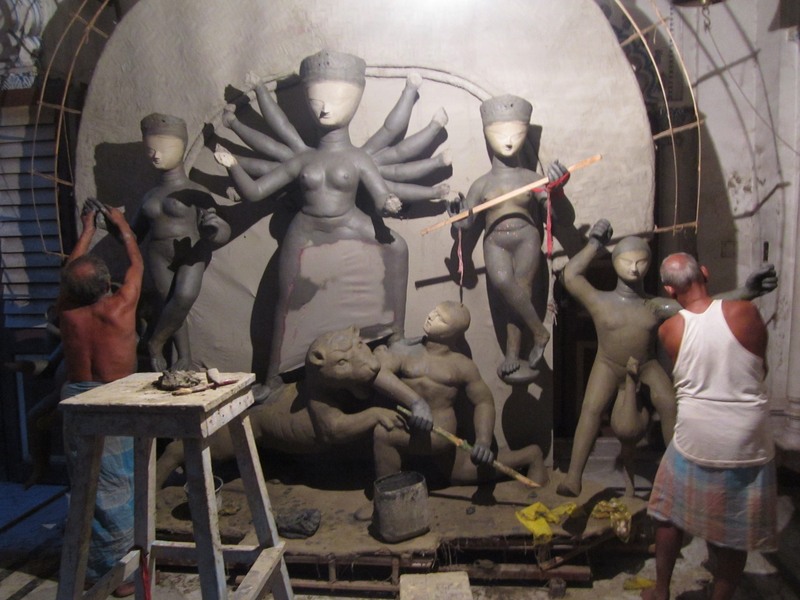 Below is a photo of another Kumartuli work-in-process where the buffalo imagery is more apparent (under Mahishasura but not painted white). Ganesha, Lakshmi, Saraswati and Kartik also have puja celebrations specifically dedicated to them at some point during the year. The timings for when the festivals take place are based on the positioning of the sun and moon, and not on a specific calendar date. Timings are available for past, present and future years from websites such as http://www.drikpanchang.com/ . Kartik is the god of war.